Chai Tea Lip Balm contains coconut and jojoba oils along with beeswax to create a natural barrier to help keep your lips soft and supple. Chai Tea Lip Balm contains coconut and jojoba oils along with beeswax to create a natural barrier to help keep your lips soft and supple. It contains a spice blend of cassia, cinnamon, cardamom, ginger, and nutmeg. A calorie-free version of your favorite chai tea! It is delicious and therapeutic at the same time. Light color will not color or stain lips. Comes in a swivel up tube. Use as often as needed. Each tube comes shrink wrapped for your protection. Ginger's Garden Lip Balms are made at the time of order to assure you of freshness and quality. These lip balms also make wonderful favors for a baby shower or a wedding. 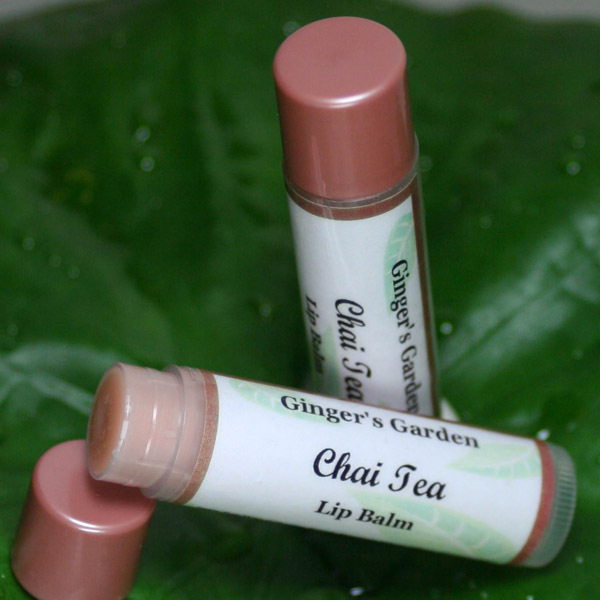 Whether you like your tea hot or iced, this Chai Tea lip balm will remind you of the best tea available. It has all the right spicy notes that proper Chai tea should have. Ingredients: Soy Wax (Glycine Soya), Beeswax (Cera Alba), Almond Oil(Prunus Dulcis), Coconut Oil (Cocos Nucifera), Jojoba (Simonsia Chinensis), Mango Butter (Mangifera Indica), Vit. E, Flavor oil Cassia, Cinnamon, Cardamom, Ginger, and Nutmeg, Sucralose, Mica.